the ShelterBox display at Llangollen International Musical Eisteddfod. 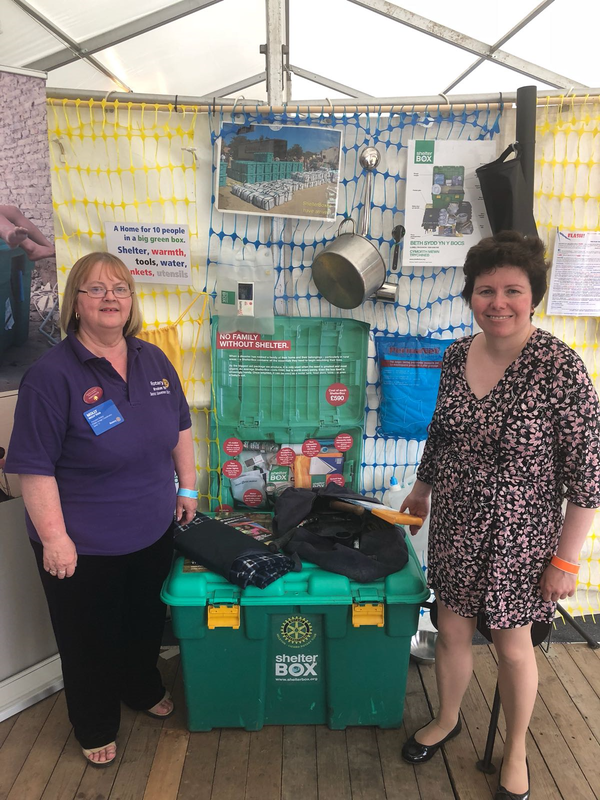 Clwyd South MP Susan Elan Jones met with top Rotarian Molly Youd at the Eisteddfod and learned about Shelterbox - a project that saves lives and helps people stranded in global disaster zones. Rhostyllen resident Molly Youd was the first female District Governor for Rotary District 1180 - an area that covers North Wales and much of the North West of England. She now holds another senior role - promoting Rotary’s People of Action message. Ms Jones said: “ShelterBox is an amazing project. Every green box sent out contains a home for ten people and while the contents vary according to climate, many provide solar lights, water storage, tools, blankets and cooking utensils. "The boxes can be sent out at very short notice and because Rotary is an international organisation with 1.2 million members in 200 countries, relief can be provide where it’s most needed right across the world. “This is one of many tremendous projects that Rotary members are engaged with and it was great to meet with my constituent Molly Youd to learn all about it."